No, you won’t find a Tyrannosaurus next to the tigers. But Point Defiance Zoo & Aquarium has dozens of living things whose roots go back hundreds of millions of years. Ferns, mosses, cycads and ginkoes – not to mention the Wollemi pine or monkey puzzle tree. Yep, we’re talking plants: living fossils that have been around since dinosaur times. And on Sunday Nov. 4, the Zoo’s lead horticulturalist Bryon Jones will give you a tour of this Jurassic Zoo. 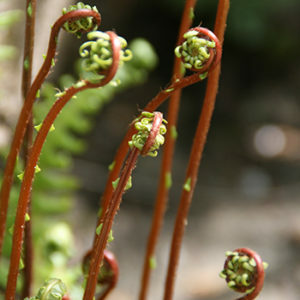 Ferns go back to the Jurassic era in the fossil record. “I love this tour – it’s so neat to tell the story of how these plants survived through time,” says Jones. And he does mean time. On the tour are ferns, whose fossil records go back 360 million years. Mosses: 320 million. Cycads: 280 million. Then you have youngsters like magnolia trees, at a mere 60 million years. How did they survive – especially with dinosaurs eating them? Well, some nearly didn’t – and that’s all part of the story. 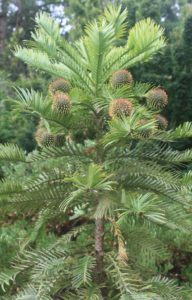 One of the Zoo’s four Wollemi pines, a plant once thought extinct and recently rediscovered in Australia. One of Jones’ first stops is a 12-foot conifer with enormous cone balls. With light green, widely spaced needles and oddly sparse branches it’s the odd man out at the Washington evergreen party. It’s a Wollemi pine, rediscovered by an Australian bushwalker in 1994 after being thought extinct forever. An ancient conifer in the Araucariaceae family, the Wollemi pine was thought to exist only in the fossil record, which dated the tree back 200 million years to the early Jurassic. 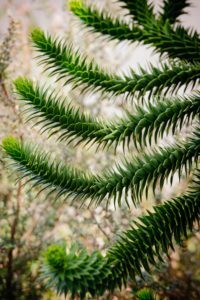 After living trees were discovered in a remote area of the Wollemi National Park near Sydney, horticulturalists have carefully begun to cultivate the pine – and Point Defiance Zoo has not one but four. FIND THEM: One tree is off the path to the right of Kids’ Zone; two others are in the bed sloping down from the old aquarium to Wild Wonders Outdoor Theater; and the fourth is between Penguin Point and Wild Wonders. The Chilean monkey puzzle tree’s signature spiky branches. Next, Jones heads for another bizarre tree – the giant monkey puzzle. Also in the Araucariaceae family, this Chilean tree is well named: the swooping, spiky branches with leaves like reptile skin look a bit like green monkey tails, and it would definitely puzzle a monkey to climb it. Here in Tacoma we’re used to seeing this tree in front yards, thanks to our climate. But visitors marvel – they’re rare in other places, Jones says. The monkey puzzle is also threatened in the wild, thanks to timber logging, and valued for its nuts, which are edible for both humans and animals. FIND THEM: The Zoo has two trees, one on the hill above the grassy lawn and the other near camels and budgies. 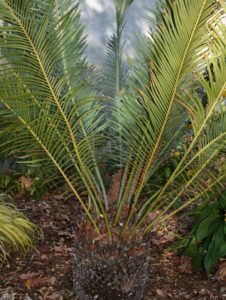 Cycads are not only prehistoric, they’re also threatened in the wild. The Jurassic period (206-144 million years ago) was a time when enormous sauropods like Brachiosaurus and Diplodocus roamed the Earth, eating vast amounts of foliage. Conifers were their staple, and Jones leads us past a majestic deodar cedar – currently spilling two-inch seed pods of bright yellow pollen everywhere – down to one of the newest beds, outside the Pacific Seas Aquarium. That’s where the cycads are: bizarre entities with pineapple-shaped trunks and three-foot leaves cascading like a fountain of needles. A massive curved male seed pod juts out with prehistoric flair. FIND THEM: Cycads, plus ferns and a magnolia, are on the south side of the Pacific Seas Aquarium. Tucked between the cycads are sword ferns. They’re the go-to Northwest landscaping native that seems to survive anything – including the last 360 million years or so. Way before conifers evolved, ferns spread their spores all over the Jurassic understory. Gingkoes – deciduous trees that reproduce with spores – also ruled the Jurassic. In fall the Zoo’s gingkoes put on a pretty show in the lower courtyard. 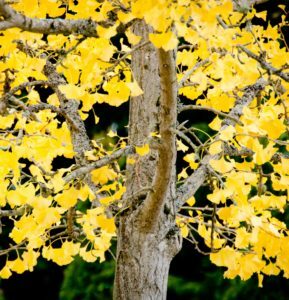 FIND THEM: The Zoo has a little glade of gingkoes in the courtyard outside the lower North Pacific Aquarium, now turning butter-yellow with fall. And after the Jurassic came a brand new phenomenon: flowers. Jones’ last stop through time is the Cretaceous period (144-65 million years ago), when plants evolved flowers and dinosaurs flourished thanks to all the extra nutrition. And the first flower? It probably looked a lot like a magnolia, according to recent studies. “Look, there’s a huge seed pod,” says Jones, pointing out a hardy magnolia with glossy green leaves hiding behind the cycads. Jones finishes his Living Fossils tour with some secret ferns not usually viewable to visitors behind the administration building: Pyrrosia sheareri, with big tangles of two-inch-wide ribbon, and a giant sprouting Wallich’s wood fern. So what can we learn from these living fossils that outlived countless animal species? TAKE THE TOUR: Bryon Jones leads the Living Fossils garden tour at 10am Sunday Nov. 4. Meet at the plaza just inside the gate. Tour free with admission. Explore all tours here.